Once the TR4A was completed (is a project like this every completed? ), I started looking for the next project. The car was a complete success, but after the first autocross at TRF, I knew I needed to upgrade the suspension and look for more power!. The suspension was easily upgraded with Addco front and rear sway bars, shorter "comp" springs in the front and a new urethane bushing kit. At the rear, since this is a solid axle TR4A, I had to get creative. With the short springs, the front now sat several inches lower, but the rear was still sitting high. The rear springs were new TRF replacement springs and the car has been sitting on the upper bump blocks since it was rebuilt. Even with a full tank of gas and a passenger, it was still sitting high. The solution was to build custom leaf spring shackles that are longer than stock. These push the rear springs higher, thus lowering the car. The end result is a TR4A that is much lower than stock, sits with it's 195/VR65/15 tires filling the wheel wells and is completely flat when cornering. These simple upgrades transform the car and make it handle like a go-cart! Okay, enough about the suspension, you want to hear about the Judson, right? Okay, after the upgrades, I really wanted something unique as there are more and more TR4A's showing up at car shows every year. So my options were to do a set of Webers or something more exotic. A Judson Supercharger would certainly qualify so I started a web search for one of the rare speed parts from the 50's-60's. After several months, I ran across a complete kit for a TR3/4 on Ebay. Turns out it was being sold by Jason Len from XK's Unlimited, so I knew it would be a good item. After the reserve was not met, we discussed it off line and a deal was struck. 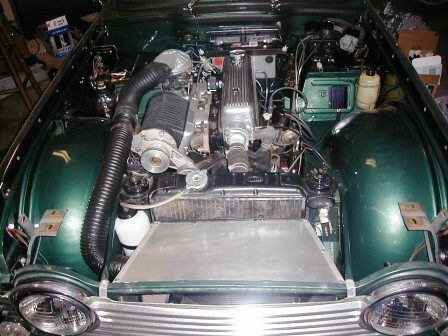 It was a complete kit and had everything I needed to install the supercharger on a TR4. Since I have a TR4A, there would be some differences, but it would not be a big deal to overcome. I am breaking down the next steps into phases as the car evolved through several phases of development . Phase 3: Phase 3 consisted of having George build a custom front pulley and new supercharger pulley to allow the supercharger to be driven directly off the crank (instead of the water pump). This fixes a major flaw of the TR design for the Judson and also allows an opportunity for additional boost. George resized the front and supercharger pulleys to allow a bit of over boost verse stock so we were looking at more like 5-6 pounds verse the original boost of 4-5 pounds. With this hardware installed, the car could now be driven again and we continued to use the car for the Fall driving season. Phase 4: Over the winter, I started plotting the next changes. Since the car was still pinging especially when it warmed up, I decided to attack the problem from several angles. To address cooling, I built an aluminum box for the radiator to force air into the radiator more effectively than the stock cardboard box!. I also decided that the supercharger needed more fuel than the single barrel carb could offer. Using a single to double barrel adapter, a Weber 36 DGV carb with custom jetting, this should resolve the fuel issues. 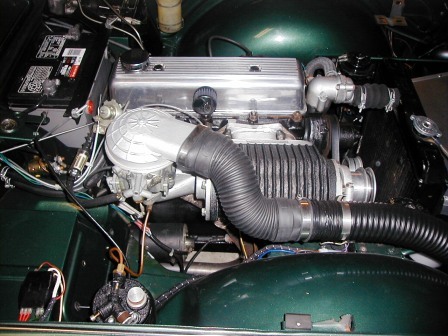 To further enhance cooling, the stock header was wrapped in header wrap, and the carb was topped with an aluminum adapter and a hose ran to a K&N carb that was mounted in the aluminum radiator box, just behind the grill. This should ensure a supply of cool air to the engine. Finally, boost gage and oxygen sensor were installed so I could see the fuel/air ratio and see how much boost was being generated. All of this was done during the spring and the car was ready to be driven by early summer. Results were mixed as it definitely had more power and when the engine was cold, it was a beast!. But when it was driven a few miles (15-20 miles), it would start to run hot and this would generate some pinging and cut back on the power. We drove the car the rest of the year, even took it to the Summer Party and drove it at the Autocross and to the various events. The car even took 3rd place in the car show. It is very unique and gathers a crowd anywhere it goes, but I am still not satisfied with the overall performance. Phase 5: This phase was not completed, but here is what would probably have to be done to make this a successful conversion. The car suffers from heat soak, so when it is pushed hard, the extra heat has no where to go, so it ends up running hot. The car needs an oversized radiator that has sufficient capacity to handle the added heat the supercharger generates. Secondly, I would go back to a stock cylinder head and cam, as my ported and polished head is probably too much for this application. All of this, and possibly combined with a knock sensor/ignition computer and/or distributor to control the spark advance would probably make this a different beast. One other contributing factor is that the car really needs another gear. So I would also need to do an overdrive conversion or one of the Toyota 5-speed conversions. So why did I not complete Phase 5? Check out the Rover V8 link!